Br J Gen Pract 2006; 56 (532): 863-868. Background Lung cancer is a common cancer disease; nevertheless, in Denmark a GP only sees one new case of lung cancer per year. The core symptoms of lung cancer, cough and dyspnoea, are on the other hand very common in general practice. This represents a challenge to the diagnostic process and increases the risk of diagnostic delay. Aim To explore diagnostic delay in primary health care among patients with lung cancer. Design of study A population based observational case series of 84 lung cancer patients' delay. Setting The County of Aarhus, Denmark. Method From county-based registers of all histological and cytological tests we identified all patients in the County of Aarhus with lung cancer diagnosed during a 6 month period in 2003. Inclusion was verified by contacting the departments involved in the treatment of lung cancer. Data were based on telephone interviews with patients' GPs. A review of delay was made starting with the first symptom until referral to secondary care. Results The overall median delay in primary health care was 32.5 days (interquartile interval (IQI) = 12–68 days). One-third of the patients were referred to the diagnostic investigation after their first consultation. Important reasons for delay in primary care were: symptoms not related to the lungs, chest X-ray without suspicion of cancer, comorbidity, waiting times for investigations and lack of explicit follow-up appointment. Prolonged delay was often due to a combination of these factors. Conclusion When diagnosing lung cancer, it is important that GPs are aware of the low sensitivity of chest X-ray. Shorter waiting times for investigations could reduce delay considerably. In Denmark, lung cancer is the second most common cancer disease among men and the third most common cancer disease among women, skin cancer excluded.1 Nevertheless, a GP in Denmark on average sees only one new case of lung cancer per year. The core symptoms of lung cancer, cough and dyspnoea, are, on the other hand, very common in general practice,2 which increases the risk of missing or delaying the diagnosis. GPs act as gatekeepers, distinguishing patients who can be investigated and treated in primary care from patients who need specialist care. Considering the high prevalence of symptoms of lung cancer in general practice and its low incidence it is neither possible nor desirable to avoid all diagnostic delay in lung cancer in primary health care. Some patients with lung cancer experience a long diagnostic delay in general practice. This study analyses the diagnostic process for a group of patients with lung cancer and identifies important reasons for delay in general practice. It shows the great impact on delay of a false negative chest X-ray and the importance of GP's being aware of the low sensitivity of chest X-ray. The aim of this study was to explore details about delay in primary care, focusing on how the patients presented symptoms, what the GPs did, reasons for delay, and to suggest areas of improvement. The study took place in the Danish County of Aarhus (680 000 inhabitants) where about 400 new cases of lung cancer are diagnosed per year. Three hospital departments in the county diagnose lung cancer: the Department of Respiratory Diseases at Aarhus University Hospital, the Department of Medicine at Randers Hospital and the Department of Medicine at Silkeborg Hospital. Surgical treatment is performed at the Department of Thoracic Surgery and radiotherapy and chemotherapy at the Department of Oncology both placed at the Aarhus University Hospital. All histological and cytological tests performed in the county are registered in two pathology registers, one at the Department of Pathology at Aarhus University Hospital and one at the Department of Pathology at Randers Hospital. We identified and included all patients living in the County of Aarhus with a newly histologically verified lung cancer diagnosed between 1 April and 31 May, and between 1 September and 31 December 2003. We wanted to include the patients consecutively but had to split the inclusion period in two due to the importance of making the interviews in due time because of the high mortality. Non-Danish speaking patients and those diagnosed outside the county were excluded. The pathology registers were searched for malignant diagnoses from biopsies from lungs, bronchia, mediastinum, and lymph nodes in mediastinum. Patients diagnosed by biopsies from other organs were identified by searching the lists of patients discussed at two weekly joint clinical conferences on lung cancer in the county. To further optimise inclusion, we contacted the departments of oncology and thoracic surgery and two of three departments in the county that diagnosed lung cancer during the periods of inclusion. The last department could not find time to complete the primary inclusion. Patients were informed about the study after treatment initiation at the department of oncology, after operation at the department of thoracic Surgery or by letter sent to their home addresses if there was no treatment to offer. Patients who died shortly after the diagnosis were included post-mortem by permission of the Danish National Board of Health. When the patient accepted participation, a time for an interview was scheduled, either at the hospital or at the patient's home. Following this interview, the patient's GP was telephone interviewed. The interviews were taped. A review of delay was made for each patient starting with the first symptom until referral to secondary care. For the purpose of this study where focus is the diagnostic process in general practice these reviews gathered information from the telephone interviews with the patients' GPs. However, for four patients the interview with the GP was not possible and for these patients we were able to collect relevant data from the patient interview and scrutinise medical records. The GP was asked to fix the date of the consultation where the patient presented the first symptom or sign that, in retrospective, was related to the lung cancer. To test the GPs' tendency to make the time from first cancer symptom to diagnosis look shorter we compared, where possible, the GP's and the patient's estimated time for the first encounter. In only one case did the GP's assessment differ from that of the patient and the GP afterwards agreed that the patient was right. Delay in general practice: the time from the patient's presentation of the first symptoms or signs that could be related to the lung cancer until referral to hospital. Delay in general practice was subdivided into: doctor delay: time elapsed without investigation of cancer-related symptoms and signs. System delay: time elapsed due to waiting times related to investigation of cancer-related symptoms and administration. Delays were estimated and in the few cases where estimators disagreed, the cases were discussed until consensus was achieved. We made descriptive statistics of the reasons for delay and calculated P-values (Mann–Whitney), medians and interquartile intervals (IQI) with STATA 8.0. We identified 132 lung cancer patients through the pathology registers. Another 14 patients were identified through the departments. In all, four patients were excluded: two because part of the diagnostic process was located outside the county and two because they did not speak Danish. Thus, 142 patients were included. Eighteen were not informed about the study for different reasons (Figure 1). Twenty-seven patients were included post-mortem. We asked 97 patients to participate and 65 patients agreed to be interviewed (Figure 1). In total, 92 patients participated in the study. For eight of these patients, the lung cancer was diagnosed at the hospital during investigation or treatment of diseases not related to lung cancer. This paper is based on the remaining 84 patients (denominator) for whom 80 (95.2%) GP interviews were performed. The patients' median age was 66 years (34–83 years) and 30 (35.7%) were women. The 84 patients' median delay was 33 days in primary health care (IQI = 12–68 days). The median doctor delay was 11 days (IQI = 0–43 days) and the median system delay in primary care 14 days (IQI = 3–26 days). There was no statistically significant difference between patients participating in an interview and patients not interviewed concerning delay in primary health care (P = 0.63), doctor delay (P = 0.08) or system delay (P = 0.57). The patients presented with many different symptoms. Cough was the most common complaint, followed by dyspnoea, fatigue, fever, and weight loss (Table 1). For 41 of the 84 patients (48.8%) the number of symptoms increased over time between the first presentation and the referral leading to the diagnosis. The distribution of different symptoms did, however, not change (Table 1). In total, 64 patients (76.2%) presented lung-related symptoms to the GP, that is, coughing, dyspnoea, haemoptysis, or thoracic pain, and these patients experienced a median delay of 29 days (IQI = 12–5 days). Fourteen (16.7%) had atypical symptoms like arthralgia, muscle pain, pain in back or shoulder, or vague symptoms such as fatigue and they had a median delay of 104 days (IQI = 37–199 days). Four patients (4.8%) with symptoms related to brain metastases had a median delay of 24 days (IQI = 9–41 days), and two patients (2.4%) who were diagnosed by chance had 1 and 9 days of delay, respectively. The GPs' main actions upon first presentation are shown in Table 2. In 26 cases (31.0%), the GP's first action led to a lung cancer diagnosis. Of these, two patients (7.7%) were acutely admitted, one referred (3.8%) to an outpatient clinic, 22 (84.6%) to a chest X-ray and one patient had another investigation. Patients referred after the first consultation or diagnosed by chance had a median delay of 13 days (IQI = 23 days) due to waiting times for chest X-ray and administration. GPs main action upon first presentation. Among 56 patients not diagnosed after the first consultation, 14 (25.0%) were diagnosed after acute admission and five (8.9%) after referral to an outpatient clinic with respiratory physicians (Table 3). A total of 34 patients (60.7%) were referred to a chest X-ray, the results of which raised suspicion of cancer. There was a 45-day median delay (IQI = 28–111 days) in cases where the GP's first action did not lead to a diagnosis. Clinical pathway for patients (n = 56) not referred to the diagnostic investigation after first consultation. In 12 (20.7%) of the 58 patients who had a chest X-ray in primary care the result raised no suspicion of cancer. Two other patients' chest X-rays were described as pneumonia and a follow-up X-ray was recommended to exclude cancer. A false negative chest X-ray contributed to substantial delay in general practice, the median delay being 161 days (IQI = 128–203) for these 12 patients compared with 27 days (IQI = 10–42 days) for the remaining patients. The median system delay was 14 days and it was mainly due to waiting times for chest X-rays. Among the 58 patients who had a chest X-ray in primary care, seven (12.1%) were referred to an acute X-ray the same day. Patients not referred acutely waited 1–57 days (17 patients waited more than 14 days). Eight had to wait another week or more before they were informed about the suspicion of lung cancer on the radiograph. Ten patients (11.9%) were referred to other investigations but during the waiting time five patients (50.0%) were referred to an outpatient clinic or a hospital ward due to suspicion of lung cancer. The rest waited 7–39 days (median = 23 days) for the investigation (gastroscopy, colonoscopy, bone scintigraphy or rheumatologic evaluation). Comorbidity produced prolonged delay for 19 patients (22.6%). For 17 (89.5%) of these patients, the symptoms of lung cancer were ascribed to an already known disease and in two patients (10.5%) an acute disease diverted the focus from the symptoms of lung cancer. Blood tests were performed in 28 (33.3%) patients. Among 14 (50.0%) of these where results of blood tests had influence on the diagnostic evaluation, only three (10.7%) cases had benefit of the blood test. The blood tests were consistent with other tentative diagnoses than lung cancer in nine (32.1%) patients and in two (7.1%) patients, blood tests were normal and gave rise to no follow up. Lack of explicit follow up appointments prolonged the delay for nine patients (10.7%), who waited 1–7 months (median 58 days) before they consulted their GP again. Often there was more than one reason for prolonged delay and the reasons causing the delay often interacted, for example, comorbidity caused misinterpretation of blood tests, or symptoms were ascribed to comorbidity after the chest radiography was described as normal. Total delay in general practice therefore consisted of several delays which added together, in some cases, gave a long delay. One-third of the patients contacting their GP with signs and symptoms of lung cancer were referred to secondary care upon their first contact, but they experienced a 2-week median delay due to system delay. Patients not diagnosed by the GP's initial actions experienced a median delay of more than 6 weeks. Patients with atypical symptoms had a median delay exceeding 3 months compared with a median delay of 1 month for patients with lung-related symptoms. The median delay for patients with a false negative chest X-ray was nearly six times longer as for patients with a first chest X-ray raising suspicion of cancer. Other important reasons for delay in primary care were: comorbidity, waiting times for investigations, and lack of explicit follow up appointment. Prolonged delay was often due to a combination of reasons. Nearly half of the patients developed new symptoms during the period of delay in general practice, often triggering referral to further investigation and shortening the delay. One-fifth of the patients waited more than 2 weeks for a chest X-ray and one-tenth waited more than a week to get the result. Blood tests only helped the diagnostic process in a few cases and most often contributed to further delay. The sample size was relatively small due to the complex data collection and therefore the statistical precision was not great enough to permit stratified analyses. On the other hand, the study is based on detailed information allowing for comprehensive explorations of the delay. The study population included all lung cancer patients in the county, and patients who died shortly after the diagnosis were also included, preventing selection bias. The population-based design strengthens the generalisability of the results. Primarily using the data from the GP interviews minimised information bias as suggested by the fact that there were no statistically significant differences in any estimation of delay between patients interviewed and patients included post-mortem. The GP-interviews were retrospective which may imply the risk of recall bias. GPs may have wanted to make the length of delay look shorter, when fixing a date for the first encounter, which would tend to underestimate delay, especially doctor delay. False negative chest X-rays are known to cause diagnostic delay in lung cancer.16,17 A recent British study showed that 23% of the patients who had a chest X-ray requested from primary care in the year before the lung cancer diagnosis had a negative chest X-ray.18 The sensitivity of chest X-rays is, however, most often discussed in connection with lung cancer screening.19,20 We found no other studies exploring the impact of a negative chest X-ray on delay for patients presenting with symptoms in primary care, and the use of X-ray in diagnosing lung cancer may need more research attention. Watchful waiting is a diagnostic and therapeutic tool in general practice and GPs often tell their patients to return if their symptoms persist or aggravate, assuming that patients will contact the GP again. A recent Dutch study found that patients with head and neck cancer not referred or followed up after their first consultation in primary care were at risk of increased professional delay.21 Several factors were related to delay in returning to the GP: type of symptoms, not being familiar with the symptoms of head and neck cancer, not being suspicious that the symptoms might indicate cancer and generally not being inclined to seek support when facing a problem. If we want to reduce diagnostic delay in lung cancer in primary care, one possibility is to reduce waiting times for chest X-rays and other investigations ordered in primary care. Another possibility is to motivate GPs to undertake an earlier reassessment of the diagnosis for the two thirds of patients who are not diagnosed upon their first consultation. This will require that GPs become aware of the low sensitivity of chest X-ray. Lack of specific follow up appointments was a reason for delay, but the fact that half of the patients experienced symptom progression probably reduced this problem. Further research is needed on how to avoid the delay that occurs when patients who received no diagnosis upon their first consultation have to contact their GP again. We thank all patients and GPs who took part in this study. Revision received April 6, 2006. © British Journal of General Practice, 2006. (2005) Nye tal fra Sundhedsstyrelsen, Causes of Death 2001. (Danish) http://www.sst.dk/publ/tidsskrifter/nyetal/pdf/2005/05_05.pdf (accessed 16 Oct 2006) p 9. (2002) Impact of delay on diagnosis and treatment of primary lung cancer. Acta Oncol 41:147–152. (2003) Effect of preoperative delay on prognosis for patients with early stage non-small cell lung cancer. J Thorac Cardiovasc Surg 125:108–113. (2001) Does treatment delay affect survival in non-small cell lung cancer? A retrospective analysis from a single UK centre. Lung Cancer 34:243–252. (2004) Effect of delays on prognosis in patients with non-small cell lung cancer. Thorax 59:45–49. (2005) Delays in the diagnosis and treatment of lung cancer. Chest 128:2282–2288. (2000) Lung cancer treatment waiting times and tumour growth. Clin Oncol (R Coll Radiol) 12(3):141–144. (1996) Diagnostic delay causes more psychological distress in female than in male cancer patients. Anticancer Res 16:995–999. (1992) Time between presentation and treatment of six common cancers: a study in Devon. Br J Gen Pract 42:419–422. (1996) Time course from first symptom to treatment in patients with non-small cell lung cancer referred for radiotherapy: a report by the CHART Steering Committee. Thorax 51:1262–1265. 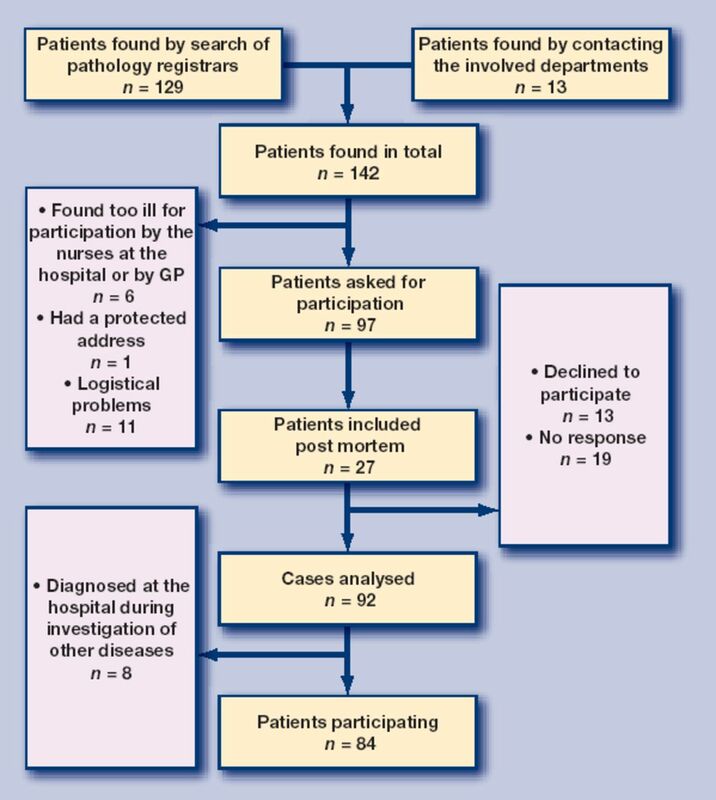 (2002) Patient's and doctors' delays in the diagnosis of chest tumors. Lung Cancer 35:53–57. (1996) Delays in the diagnosis and surgical treatment of lung cancer. Thorax 51:903–906. (2004) Lung cancer: clinical presentation and specialist referral time. Eur Respir J 24:898–904. (1999) Miss rate of lung cancer on the chest radiograph in clinical practice. Chest 115:720–724. (2002) Misinterpretation of the chest x-ray as a factor in the delayed diagnosis of lung cancer. Postgrad Med J 78:158–160. (2006) Negative chest x-ray in primary care patients with lung cancer. Br J Gen Pract 56:570–573. (2003) Initial evaluation of the patient with lung cancer: symptoms, signs, laboratory tests, and paraneoplastic syndromes. Chest 123(1 Suppl):97S–104S. (2001) The early diagnosis of lung cancer. Dis Mon 47:204–264. (2005) Patient factors associated with delay in primary care among patients with head and neck carcinoma: a case-series analysis. Fam Pract 22:554–559.